The Democratic Union Party or PYD (Kurdish: Partiya Yekîtiya Demokrat‎; Arabic: حزب الاتحاد الديمقراطي‎, translit. Ḥizb al-Ittiḥad al-Dimuqraṭiy; Classical Syriac: ܓܒܐ ܕܚܘܝܕܐ ܕܝܡܩܪܐܛܝܐ‎, translit. Gabo d'Ḥuyodo Demoqraṭoyo) is a Kurdish democratic confederalist political party established on 20 September 2003 in northern Syria. It is a founding member of the National Coordination Body for Democratic Change, and is described by the Carnegie Middle East Center as "one of the most important Kurdish opposition parties in Syria". It is the leading political party in the Democratic Federation of Northern Syria and its regions. Chemical engineer Salih Muslim became its chairman in 2010, and Asiyah Abdullah its co-chairwoman in June 2012. On its website, the PYD describes itself as believing in "social equality, justice and the freedom of belief" as well as "pluralism and the freedom of political parties". It describes itself as "striving for a democratic solution that includes the recognition of cultural, national and political rights, and develops and enhances their peaceful struggle to be able to govern themselves in a multicultural, democratic society." The PYD is a member of several organisations, e.g. the Kurdistan Communities Union (KCK). The PYD has adopted Democratic Confederalism as one of its ideologies and have implemented ideas of Murray Bookchin and Abdullah Öcalan in Rojava, where hundreds of neighborhood-based communes have established across the three Rojava cantons. Like the KCK umbrella in general, and even more so, the PYD is critical of any form of nationalism, including Kurdish nationalism. This policy stands in stark contrast to the Kurdish nationalist visions of the Kurdish National Council. While the Syrian Ba'ath government had always been oppressive towards its own Kurdish minority, former president Hafiz al-Assad supported Kurdish factions in neighboring Iraq and Turkey in order to exert pressure on regional rivals. In 1975, Assad offered the Iraqi Kurdish leader Jalal Talabani a safe haven in Damascus to found his new Patriotic Union of Kurdistan (PUK). From the 1980s, Assad also supported the Kurdistan Workers' Party (PKK) against his regional rival Turkey, until he bowed to pressure from Ankara and sought improved political and economic relations. In 1998, the Syrian government banned Kurdish political parties and organizations, including the PUK and PKK. Five years later, the PYD was founded by Syrian Kurds. At the same year, Salih Muslim left the Kurdistan Democratic Party of Syria (KDP-S), an affiliate of the Kurdistan Democratic Party of Iraq and joined the newly formed PYD. According to the Carnegie Middle East Center, the PYD suffered years of violent repression at the hands of the Syrian regime. Turkish sources have claimed that the PYD was secretly founded in 2003 by PKK while other sources have described it as a common political party founded by Kurdish separatists. Though Syrian security forces had already for several years been targeting members of Kurdish political parties and organizations who stayed in Syria, the PYD came under intensified persecution in the aftermath of the 2004 Qamishli riots across northern Syria. According to Human Rights Watch, the Syrian government saw the party as a particular threat due to its "ability to mobilise large crowds", and suspected it of organising numerous demonstrations. Therefore, many PYD activists imprisoned in the aftermath of the uprising were not given the amnesty that Bashar al-Assad granted other Kurdish detainees as a later goodwill gesture. On 2 November 2007, PYD activists organised large demonstrations in Qamishli and Kobanê, drawing hundreds of Kurds to protest Turkish threats to invade Iraqi Kurdistan, and Syria’s support of Turkey’s decision. Security forces—including a unit brought from Damascus—fired tear gas in an effort to disperse the crowds. When some protesters reportedly began to resist by throwing stones, the police opened fire with live ammunition, killing one and injuring at least two more. Dozens of Kurds (among them women and children) were detained in the ensuing police crackdown. Most were soon released, but 15 activists—three of them party officials—remained imprisoned and were sent before a military court on various charges. From 2006 to 14 April 2009, at least two dozen PYD activists were formally tried before a special security court, some receiving sentences from five to seven years on charges of membership in a "secret organisation" and seeking "to cut off part of Syrian land to join it to another country". Many others were detained, often in severe conditions and without basic legal rights—some of those released reported being kept in extended solitary confinement and even being subjected to physical and psychological torture. Syrian security forces also often continued to harass activists and their families even following their release. While similar methods were employed against many Kurdish prisoners and activists in Syria, Human Rights Watch noted that the security forces tended to reserve their harshest treatments for PYD members. With the outbreak of antigovernment demonstrations across Syria in early 2011, the PYD joined the Kurdish Patriotic Movement in May, and was a founding member of the National Coordination Body for Democratic Change in July and of the KCK-aligned People's Council of Western Kurdistan in December. Unlike most other Kurdish Syrian parties, it did not initially join the Kurdish National Council (KNC) when it was formed in October 2011, but agreed on cooperation together with the KNC and as a result, the Kurdish Supreme Committee was founded. Although critical of the Syrian government, the PYD also criticised the Syrian opposition, including the Syrian National Council (SNC), which it accused of acting in Turkey's interests. The SNC's unwillingness to support Kurdish autonomy led all but one of its Kurdish parties to leave by February 2012. Over 640 prisoners related to PYD were released by the Syrian security apparatus in 2011, most of which returned to the North. In mid-2012 the People's Council of Western Kurdistan signed an agreement with the Kurdish National Council (KNC), forming a joint Kurdish Supreme Council (Kurdish Supreme Committee) and agreeing to cooperate on security for Kurdish areas, forming People's Protection Units (YPG). This followed an "operational decision made by the Assad regime in mid-July 2012 to withdraw the majority of its forces from Syria’s Kurdish areas" (leaving a strong presence only in Qamishli and Al-Hasakah), prompted by a major opposition offensive against the capital Damascus. According to the Carnegie Middle East Center, "Despite these agreements, the Kurdish National Council has accused the PYD of attacking Kurdish demonstrators, kidnapping members of other Kurdish opposition parties, and setting up armed checkpoints along the border with Turkey." In mid-2012 Reuters cited unconfirmed reports that the towns of Amuda, Derik, Kobani and Afrin were under PYD control. Abdelbasset Seida, head of the opposition Syrian National Council claimed in July 2012 after a meeting with Turkish Foreign Minister Ahmet Davutoğlu that the Syrian Army had handed over control of certain parts of northeastern Syria to the PYD. The PYD's alleged control over certain areas was said to have led to disputes and clashes between the PYD, the KNC, and the Syrian National Council. The PYD soon became the dominant force in the Kurdish opposition, with its members running checkpoints on major roads and entrances to Kurdish cities. Under the agreement with the KNC, cities that fall under the control of Syrian Kurdish forces would be ruled jointly by the PYD and the KNC until an election can be held. However, the PYD quickly abandoned the coalition with tribalist Kurdish nationalists for the aim of creating a polyethnic and progressive society and polity in the Rojava region. In November 2013, the PYD announced an interim government, divided into three non-contiguous autonomous areas or cantons, Afrin, Jazira and Kobani. Leftist media commented that "Kurdish rebels are establishing self-rule in war-torn Syria, resembling the Zapatista experience and providing a democratic alternative for the region." The polyethnic Movement for a Democratic Society (TEV-DEM), led by the Democratic Union Party (PYD), is the political coalition governing Rojava. According to Zaher Baher of the Haringey Solidarity Group, the PYD-led TEV-DEM has been "the most successful organ" in Rojava because it has the "determination and power" to change things, it includes many people who "believe in working voluntarily at all levels of service to make the event/experiment successful". For a former diplomat like me, I found it confusing: I kept looking for a hierarchy, the singular leader, or signs of a government line, when, in fact, there was none; there were just groups. There was none of that stifling obedience to the party, or the obsequious deference to the "big man"—a form of government all too evident just across the borders, in Turkey to the north, and the Kurdish regional government of Iraq to the south. The confident assertiveness of young people was striking. The civil laws of Syria are valid in Rojava, as far as they do not conflict with the Constitution of Rojava. One notable example for amendment is the family law, where Rojava proclaims absolute equality of women under the law and a ban on polygamy. For the first time in Syrian history, civil marriage is being allowed and promoted, a significant move towards a secular open society and intermarriage between people of different religious backgrounds. In 2012, the PYD launched what it originally called the Social Economy Plan, later renamed the People’s Economy Plan (PEP). The PEP's policies are based primarily on the work of Abdullah Öcalan and ultimately seek to move beyond capitalism in favor of Democratic Confederalism. Private property and entrepreneurship are protected under the principle of "ownership by use", although accountable to the democratic will of locally organized councils. Dr Dara Kurdaxi, a Rojavan economist, has said that: "The method in Rojava is not so much against private property, but rather has the goal of putting private property in the service of all the peoples who live in Rojava." Beginning with the Battle of Kobanî, the United States supports the PYD. It was only after months of scraping by and refusing to admit defeat at the hands of the ISIL that the United States recognized the YPJ-YPG as potential allies fighting ISIL. On October 11 and 12 of 2014 U.S officials met secretly members of the PYD and later that month, announced its support for YPJ fighters in Syria. The United States provided similar support for the YPJ in the Battle of Raqqa, a former stronghold of the Islamic State. U.S support for the PYD, however, is nuanced and is by no means unconditional. Turkey, a key U.S NATO ally, vehemently opposed the Syrian Kurdish forces. During the early years of Syrian civil war, Turkey let the PYD leader and members use Turkish soil without restrictions. Turkish ministers had several times met the PYD leader Salih Muslim. The Turkish government's relationship with the Kurds has deteriorated since the Siege of Kobanî, when Turkey refused to help Kurdish fighters against ISIL and let Turkish Kurds support Syrian Kurds against ISIL. There were riots around country where demonstrators protested against the government. A number of attacks in Turkey were blamed on the PKK and Kurdish strongholds were bombed in response, prompting the PKK to announce the end of the negotiated ceasefire. Despite its current apparent strength in Syria, the group's leader, Salih Muslim, claims that the group desires Kurdish autonomy within a new democratic Syria rather than Kurdish independence. After Turkey changed its view towards PYD, it accused PYD of being a branch of the PKK and since then the PYD has had poor relations with Turkey, which currently views the PYD as a Syrian branch of the PKK. Turkish President Erdogan has threatened that he would not allow the creation of a Kurdish autonomous area in Syria. Erdogan also views the recent territorial gains by the PYD as being the result of a deliberate transfer from Assad to the PYD. According to Reuters, the PYD were not invited to a meeting between the Turkish Foreign Minister, the Syrian National Council, and the Kurdish National Council to discuss the future of Syria. This has led some to suggest that the Turkish government is trying to encourage the marginalization of the PYD in the Kurdish opposition due to the group's links with the PKK. Muslim held talks with Turkish officials in July 2013 in regards to seeking autonomy within Syria. According to some officials, Turkey's demands included that the PYD not seek autonomous region through violence, not harm Turkish border security and be firmly opposed to the Syrian government. Turkey president Recep Tayyip Erdoğan has in August 2016 stated "extermination of the PYD" is a policy aim of the government of Turkey. The Syrian opposition accused the PYD of being responsible for the October 2011 assassination of KNC leader Mashaal Tammo, while the PYD has maintained that Turkey was responsible and son of Mashaal Tammo accused the Syrian regime. However, in October 2012, Saudi-owned TV channel Al-Arabiya published documents allegedly proving that Bashar al-Assad himself had engaged the Air Force Intelligence Directorate to assassinate Tammo. On 20 January 2018, Turkey began a military offensive, titled "Operation Olive Branch" against the by the PYD governed Canton Afrin. According to Anne Peters, director of foreign public law and international law at the Max-Planck Institut there has to be a mandate of the UN Security Council or the allowance of the invaded country, in the current case Syria, for a legal military incursion from another state. This Turkish opposition to the PYD has made U.S support challenging from the get-go. The U.S is constantly trying to distance itself from the PYD, and more importantly, distance the YPJ from the PKK. In October 2014, a U.S State Department official announced that the United States considers the PYD, and by extension YPJ-YPG, an organization separate from the PKK. This announcement came despite the fact that the PYD has clear ties to the PKK, drawing its ideological foundation from Abdullah Öcalan, the PKK leader who is imprisoned by the Turkish regime. Another way in which U.S officials looked to paint the PYD as separate from the PKK was to have them join the Syrian Democratic Forces (SDF). U.S Special Operations Commander Raymond Thomas explains that the U.S told PYD leadership "you’ve got to change your brand...And with about a day’s notice they declared that they were the Syrian Democratic Forces." By allying itself with PYD, the United States is guilty of infuriating the Turkish regime, and has had to go out of its way to appease its NATO ally. During his time as president of the United States, Barack Obama had to make a number of personal phone calls to Turkish President Recep Tayyip Erdogan to appease the outraged Turkish leader. What is more, on the November 6, 2018, U.S Deputy Assistant Secretary of State for European and Eurasian Affairs, Matthew Palmer, announced U.S bounties on three leaders of the PKK, Murat Karayilan, Cemil Bayik, and Duran Kalkan. The value of the three bounties combined is $12 million. The announcement of the bounties—a move strongly praised by the Turkish regime—represents a potential conflict in policy, with the U.S fighting alongside YPJ-YPG, while actively looking to capture members of the PKK. There is also a break between American soldiers on the ground and the policy makers in Washington. 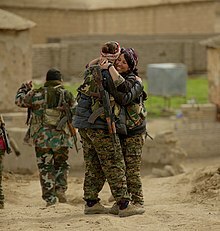 The soldiers who interact with YPJ-YPG fighters regularly are more fully supportive of their Kurdish allies, and even began wearing patches with the YPG symbol on their American uniforms. When officials heard of this development, however, the U.S soldiers were ordered to remove the patches. Unlike the soldiers, U.S officials see the YPJ-YPG as "proxies" rather than allies. In Germany, there is a ban on PKK symbols that, as of March 2017, is officially extended the YPG and YPJ flags and symbols. Certain German states will prosecute German citizens for posting YPJ-YPG symbols on social media, or bringing their flags to protests. The PYD was also accused in 2011 of working with the Assad regime in Syria. This allegation, however, is not verified and is contradicted by the fact that YPJ-YPG "forces clashed with pro-Assad forces in Aleppo, Qamislo, and Hasakeh." ^ "PYD elect new co-chairs at party congress". Rudaw. 28 September 2017. Retrieved 18 December 2018. ^ "'PYD`ê ji bo parastina mafê gelê Kurd li Rojava hatiye damezrandin'". Hawar News. 26 September 2017. Archived from the original on 29 September 2017. Retrieved 26 September 2017. ^ "Member Parties of the Socialist Internationale". Archived from the original on 3 November 2013. Retrieved 17 February 2016. ^ a b c "A Dream of Secular Utopia in ISIS' Backyard". New York Times. 24 November 2015. Retrieved 20 May 2016. ^ a b "Syrian Kurdish leader: We will respect outcome of independence referendum". ARA News. 3 August 2016. Retrieved 4 August 2016. ^ "Kurdish National Council announces plan for setting up 'Syrian Kurdistan Region'". ARA News. 4 August 2016. Retrieved 4 August 2016. ^ "PYD kimdir ? PKK'nın Suriye kolu mu ? - Timeturk: Haber, Timeturk Haber, HABER, Günün haberleri, yorum, spor, ekonomi, politika, sanat, sinema". timeturk.com. Retrieved 11 January 2017. ^ a b c "Group Denial: Repression of Kurdish Political and Cultural Rights in Syria" (PDF). Human Rights Watch. November 2009. Retrieved 14 November 2013. ^ "Syrian Kurds Trade Armed Opposition for Autonomy - Al-Monitor: the Pulse of the Middle East". Al-Monitor. ^ "Barzani Unites Syrian Kurds Against Assad". Al-Monitor. 16 July 2012. Retrieved 25 July 2012. ^ a b c "Syrian Kurdish moves ring alarm bells in Turkey". Reuters. 23 July 2012. Retrieved 25 July 2012. ^ "More Kurdish Cities Liberated As Syrian Army Withdraws from Area". Rudaw. 20 July 2012. Archived from the original on 15 October 2014. Retrieved 1 July 2013. ^ "Liberated Kurdish Cities in Syria Move into Next Phase". Rudaw. 25 July 2012. Retrieved 1 July 2013. ^ "PYD Announces Surprise Interim Government in Syria's Kurdish Reg". Rudaw. ^ "Rojava revolution: building autonomy in the Middle East". ROARmag. 25 July 2014. Retrieved 9 October 2014. ^ "The experiment of West Kurdistan (Syrian Kurdistan) has proved that people can make changes". Anarkismo.net. Retrieved 21 October 2014. ^ "A Very Different Ideology in the Middle East". Rudaw. ^ "Syrische Kurden verkünden gleiche Rechte für Frauen". derStandard.at. ^ "Syria Kurds challenging traditions, promote civil marriage". ARA News. 20 February 2016. Archived from the original on 22 February 2016. Retrieved 23 August 2016. ^ A Small Key Can Open a Large Door: The Rojava Revolution (1st ed.). Strangers In A Tangled Wilderness. 4 March 2015. ^ Michael Knapp, 'Rojava – the formation of an economic alternative: Private property in the service of all'. ^ a b c Tax, Meredith (2016). A Road Unforeseen. New York, NY: Bellevue Literary Press. ^ a b c d e Hunt, Edward. "The Kurdish Dilemma". jacobinmag.com. Retrieved 5 December 2018. ^ a b Blinken, Antony J. (31 January 2017). "Opinion | To Defeat ISIS, Arm the Syrian Kurds". The New York Times. ISSN 0362-4331. Retrieved 5 December 2018. ^ "Kurdish Separatists End Cease-Fire After Turkish Airstrikes". VOA News. 25 July 2015. Retrieved 29 July 2012. ^ "Crisis in Syria emboldens country's Kurds". BBC News. 28 July 2012. Retrieved 11 August 2012. ^ "Syrian Kurd party says Turkey should not fear its rise". Reuters. 7 August 2012. Retrieved 11 August 2012. ^ "Kurds could help shift course of war in Syria - World - The Star Online". thestar.com.my. ^ "Has Turkey really stepped into 'Syrian quagmire'?". Al-Monitor. 26 August 2016. Retrieved 30 August 2016. ^ "Thousands of Kurds could awaken against Syrian regime". Telegraph.co.uk. Retrieved 23 October 2016. ^ Turkey, Agencies in (21 January 2018). "Turkey bombs Kurdish-controlled city of Afrin in northern Syria". the Guardian. Retrieved 28 January 2018. ^ Strauch, Christoph (23 January 2018). "Offensive gegen Kurden: Verstößt die Türkei gegen das Völkerrecht?". FAZ.NET (in German). ISSN 0174-4909. Retrieved 28 January 2018. ^ Redcrow, Dr Thoreau. "When shame is a badge of honor: the US State Department's bounties on the PKK". theregion.org. Retrieved 5 December 2018. ^ "'US putting bounties on PKK positive, belated step'". aa.com.tr. Retrieved 5 December 2018. ^ Kurdistan24. "German YPG flag ban continues despite Kurdish fight against Islamic state". Kurdistan24. Retrieved 5 December 2018.